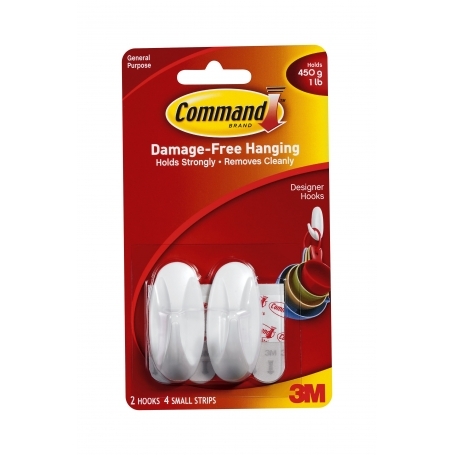 Command™ Hooks are available in a wide range of sizes and designs to match your needs and style. Forget about nails, screws and tacks, these are fast and easy to hang! They hold strongly on a variety of surfaces, including paint, wood, tile and more. Yet removes cleanly - no holes, marks, sticky residue or stains. The standard delivery cost is $6.50 including GST per order. Rural delivery is $13.00 per order. The delivery cost is displayed where you choose your shipping option upon your purchase when completing the checkout process. If your order is very large or your delivery address is outside our normal delivery coverage a special delivery cost may be added, in this case we will contact you to discuss the charges and options. Please note that delivery to Waiheke Island, Stewart Island are likely to incur additional costs. Storage Box does allow pick up in store, where there is a Storage Box in your area. Otherwise we will need to deliver your order to you and charge a courier fee for this. There are quantities limits on some products when purchasing online. If you would like to purchase in bulk or trade quantities please contact your nearest Storage Box store. If you receive product broken or faulty product you're entitled to have your product repaired, replaced or refunded under the Consumer Guarantees Act. This must be returned to the store you purchased from online and proof of purchase is required. Please contact the store which you originally purchased from. Please note we will not accept returns if you simply change your mind.